ENGAGEMENT RING WOMAN DIAMOND WHITE GOLD 18CT PRINCESS CUT SOLITAIRE 18KT. Condition is Used. The ring has been worn and has tarnished a little. It is a beautiful ring but is now no longer needed. It’s time to pass it on. Please excuse the rubbish photos, tried my best to show the ring (pics don’t do it justice) Rapid Dispatched with Royal Mail Signed For® 2nd Class. *Sold as seen. 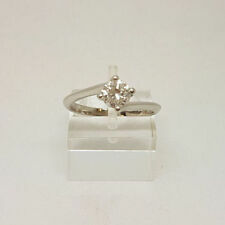 New listingBrand New Platinum Solitaire Diamond Ring 0.30ct VS G Size M NO RESERVE!!! Condition is New. GROSS WEIGHT 3.35 GRAMS. CARAT WEIGHT 0.30. CLARITY VS. RING SIZE H/M. New listingBrand New Platinum Solitaire Diamond Ring 0.62ct VVS H-I Size H/ NO RESERVE!!! CLARITY VVS. Condition is New. COLOUR H-I. RING SIZE H/M. NO RESERVE!! Lovely Ernest Jones Platinum 950 Solitaire Princess Cut Diamond Ring 0.25 Carats. Fully stamped with the makers mark SG and the 950 platinum UK hallmark. Also stamped with the diamond carat weight of 0.25 and the original ID number F3E39228. CLEARANCE! 1.02ct NATURAL DIAMOND RING HANDMADE SOLID 18ct ROSE GOLD VIDEO NR! A Handmade and Unique 1.02ct Solitaire Diamond 18ct Rose Gold Ring! (N.B. Photo's and Video are taken using both natural and LED lighting. Colours shown will vary due to this and your individual monitor settings. ). For sale is this: *Stunning 18ct White Gold 1.04ct Emerald Cut Diamond Solitaire Ring (over 1ct)*​ This beautiful ring is set with a natural 1.04ct Emerald cut diamond solitaire in to a four-claw head. Weight: 1.04ct. Clarity: I2. Colour: E (white). The stone is included,but its a bright white,full of life,sparkle and brilliance! UK hallmarked for 18ct gold and engraved for diamond weight. Weighs 3.2 grams approx. In very good pre-owned condition. UK size L 1/2 and US size 6 1/4approx. ANY QUESTIONS PLEASE EMAIL. Please view all pictures,these form part of the description. MODEL EBY040 - 18ct White Gold certified with 750 stamp. The ring is in 18ct white gold certified by the 750 stamp stamped on the inside of the ring shank. Ring in 18Kt white gold with2.30g certificate with 750 stamp stamped on the inside of the ring shank. Lovely Platinum 950 Solitaire Princess Cut Diamond Ring 0.33 Carats. Fully stamped with the makers mark MJ and the 950 platinum UK hallmark as well as the diamond carat weight of 0.33. Beautiful square princess cut 0.33 carat diamond set in platinum. 18ct white gold ring with 0.51ct diamond solitaire from Ernest Jones for £1600 back in 2004. NEW & CERTIFIED 18ct White Gold Natural Diamond Solitaire Ring 0.33ct was £695!! Stamped 750 (18ct). Never worn (apart from taking picture) 18 ct white gold solitaire diamond ring. 0.33 carat, good quality ring and certified. See my other diamond rings. The other ring (used for comparison purposes) is of a similar grade - but is 0.50ct and set in platinum - they are both G colour and SI1 clarity. Graded Mounted. The photographs showing 2 diamond rings are for comparison only! Colour I (near colourless). Beautiful clear diamond set in 18ct white gold band. Very solid and not hollowed out. Overall condition is excellent. Minimal sign of wear. Clarity I2 (though in my opinion looks a lot better). For sale is a beautiful H Samuel Forever Diamond engagement ring, 18ct white and yellow gold with a 0.27ct 73 facet diamond. A very pretty and sparkly engagement ring in excellent condition and hardly worn, as seen in the photographs. RRP £1000. Ring size L.
9ct Gold .25 1/4ct Diamond Solitaire Engagement Ring. Condition is Used. Dispatched with Royal Mail 1st Class. A STUNNING PRINCESS CUT DIAMOND SOLITAIRE RRP£1750! QUALITY DIAMOND SET IN 18CT LUXURIOUS WHITE GOLD>>FULLY HALLMARKED>>>CLEAR G - H SPARKLING DIAMOND! ALWAYS HAPPY TO HELP! HALLMARKED PLATINUM -. TWIST-STYLE PLATINUM 4-CLAW SETTING. SET WITH A 0.33ct ROUND BRILLIANT-CUT DIAMOND. DIAMOND CARAT WEIGHT 0.33ct. note - the diamond has one main carbon inclusion - not visible to the naked eye but easily visible under 10x magnification. 18ct Yellow Gold 1ct Natural Diamond Solitaire Ring SI2 E Gorgeous! THIS DIAMOND SOLITAIRE RING I BOUGHT 7 MONTHS AGO AND IT HAS A HIGH SPECIFICATION: E COLOUR, SI2 CLARITY AND VERY GOOD CUT. AS A SIZE T IT IS SIZEABLE. THE STONE IS CLEAR NOT CLOUDY TO THE NAKED EYE WITH AN EXCELLENT SPARKLE. 1.06 ct Natural Real Diamond 14K White Gold Ring 360° Video !!! 14K WHITE GOLD. If needed we can resize the ring shank. GEM GENERAL INFORMATION. Diamonds without these birthmarks (inclusions) are rare, and rarity affects a diamond’s value;. EARTH MINED DIAMOND. 1.06ct 6.62mm. NEW 18ct Gold Diamond Solitaire Ring. A classic design diamond solitaire in 18ct yellow gold, with diamond shoulder accents. A very beautiful sparkling diamond that is bright, white and very fiery. Width of the centre diamond is 5mm. 18ct Gold Diamond Solitaire Ring. A classic design diamond solitaire in 18ct yellow gold. The diamond has been graded and has a certificate.The Colour is G, the Clarity I-1 and Carat 0.45. Ring size. Independently verified by ANCHORCERT as being genuine HIGH GRADE DIAMOND - report included. OUR PRICE £550 ono - recent ANCHORCERT DIAMOND REPORT included. HALLMARKED 18ct gold setting. Diamond is round brilliant-cut, 0.30ct col K, cl SI1. Diamond Clarity: SI1 (Certified). Total Carat Weight: 0.51 Carat (Certified). Diamond Color: H (Certified). We do not believe in mass production, each and every piece is hand picked to ensure quality. 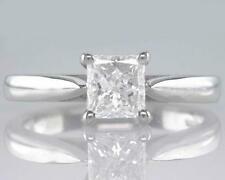 1.06 ct Real Diamond 14K White Gold Engagement Ring - Video! 14K WHITE GOLD 1.8g. If needed we can resize the ring shank. GEM GENERAL INFORMATION. 1 Diamond Gemological report. 1.06 ct / 6.25 mm. EARTH MINED DIAMOND. NUMBER OF DIAMOND. Diamonds without these birthmarks (inclusions) are rare, and rarity affects a diamond’s value;. Genuine 1/3 carat Diamond Solitaire Ring! Beautiful eye clean and shiny Diamond. This ring is in good pre loved condition - The band has worn a little thin, although not out of shape. Certificate : WGI Certified Main stone shape : Princess. Diamond Education. Diamond color : F Cut : Very Good. Main stone : Diamond Style : Claw Set. Ring Size Chart. Main stone Diamond. This ring is also available in following sizes H, H½, I, I½, J, J½, K, K½, L, L½, M, M½, N, N½, O, O½, P, P½, Q, Q½, R, R½, S, S½. EARTH MINED DIAMOND. 14K WHITE GOLD. If needed we can resize the ring shank. Diamonds without these birthmarks (inclusions) are rare, and rarity affects a diamond’s value;. 1 Diamond Gemological report. 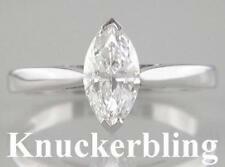 Stunning 18ct 0.38ct White gold solitare diamond ring. Size K although you could get it resized if needed. Have all the genuine paperwork for this ring. It has such clear clarity and sparkle. As you can see from the pictures it is 0.38ct, colour grade J so it is a top quality diamond. The ring will come with the proof of authenticity and in the box. Any questions please ask as I do not accept returns. Thank you for looking. 0 71ct IGI Princess 14k - YouTube. For example on the Fraser Heart website - type in product number "01-01-9-0020". Paste link into a browser window:[isdntekvideo]. We always gather evidence of positive diamond testing for each item. Genuine Princess Cut Diamond Solitaire Ring! One 25 point Diamond (3mm square cut diamond in 5mm square setting) - Beautifully displayed in a low to the finger design with a little heart shape cut out to let the light shine through. MODEL R024 - 18ct White Gold certified with 750 stamp. The ring is in 18ct white gold certified by the 750 stamp stamped on the inside of the ring shank. Ring in 18Kt white gold with3.80g certificate with 750 stamp stamped on the inside of the ring shank. The diamond is set in wonderful platinum. There is a hallmark showing '950' for platinum. The ring has also been certificated by gem lab. The 0.42 carat diamond is cute into a perfect round shape with four strong claws. 0.96 ct earth mined diamond 14K White Gold Ring Video 360 ! EARTH MINED DIAMOND. If needed we can resize the ring shank. 14K WHITE GOLD. Diamonds without these birthmarks (inclusions) are rare, and rarity affects a diamond’s value;. GEM GENERAL INFORMATION. 0.96 ct / 6.30 mm. Colour ~ E Colourless (assessed using a set of colour grading stones under GIA light box. Clarity ~ VVS1 ~ Eye clean/very clear. Really lovely solitaire ~ stylish and elegant. Diamond is tested with a Presidium Diamond Tester. ).